Ever ponder on some mysterious album that somehow, for no apparent reason, becomes a mythical icon and you don't even know why? 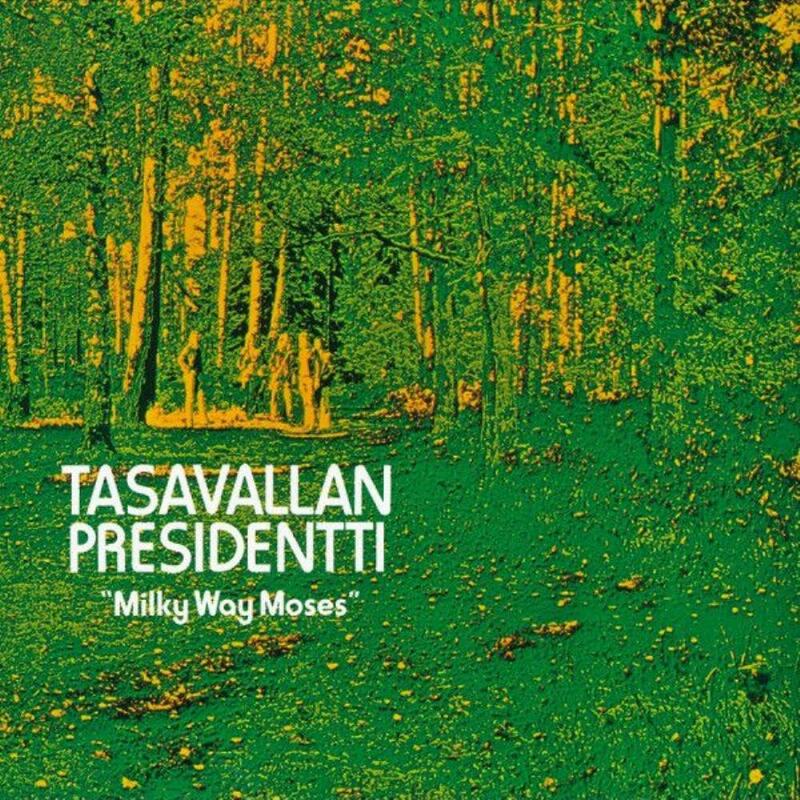 That is how I feel by Tasavallan Presidentti's Milky Way Moses, an LP I bought back in 1974 or so, initially enamored by the lovely cover art of bright green and sharp yellow trees and finally enthralled by the cool jazzy prog within the grooves. I finally nailed a CD copy and was immediately plunged into a drenching pool of self-inflicted nostalgia that has me beaming. This album remains my favorite Finish prog recording (though the recent Moonwagon albums come awfully close). Jukka Tolonen needs no introduction, a legendary guitarist closely associated in my mind with vintage Jan Akkerman, where robust jazzy chords and slick leads conspire to woo the casual listener and convert them permanently. Together with bassist Heikki Virtanen, sax/flute master Pekka Pöyry and drum king Vesa Aaltonen, Tolonen provides a shimmering glide for singer Eero Raittinen to show off his vocal skills. A nice mix of short and long tracks makes for a delightful menu. There is little pussyfooting here as title track takes off from the get-go, a flick of the wrist envelops the axe strings with confident technique allied with intense feeling and you just know this will be fun. Breezy, airy jazz- rock, a cool urban vibe where blaring saxophones, tingling piano and that dogged riff keep it all hanging tight. Eero vocalizes nicely in a semi-trembling yelp that is actually quite striking. The stage is set for some soloing, well anchored by the rhythm tandem. Jukka then takes the spotlight and delivers a wah-wah duet with Pekka's squeaky sax, a true masterpiece moment where both maul each other with clever mini blasts, a delirious little musical game. Another vocal refrain which veers into a heavier raging funk and the deed is done. Excellent! The stunning 11 minute+ epic "Caught from the Air" is another highlight moment, a thrilling musical escapade that swerves in a myriad of directions. Feline guitar and fluttering piano combine to create a jazz tornado that ultimately permits Pekka to go bananas on his sax, in a very overt Didier Malherbe style. Midway through, the groove goes from very relaxed, almost like instrumental Stealy Dan, to more hysterical, notes blasted at a furious pace and decidedly jazz where screeching organ, pounding piano, irate sax and mad guitar rule the waves. The vocals return to that familiar exuberance and the whole just glides along with zest to an effortless finale. On "Jelly", Virtanen and Aaltonen propel the jiggly jello-jazz with syncopated mayhem, a delightful turbo- powered lightning bolt that knows no respite just finality. Disjointed yet controlled, the manic 3 minute + piece shows off the talents of all involved. The Focus parallel is evident in both the guitar and the turbulent drumming. A true 70s vibe appears on "Confusing the Issue" which incorporates some odd stylistics, a Planet Gong cabaret meets Frank Zappa feel, with Eero doing odd things with his voice ("Cucumber Stew"? ), not unlike the zealous Canterbury lads. Tolonen rips off an acid-drenched solo, making anyone within earshot to giggle nervously. The longest sucker is the nearly 14 minute "How to Start a Day", a weird introduction that has some Gong meets the Legendary Pink Dots facets, which then prompts bassist Virtanen to shovel along a clearly defined but relentless groove, flute spiraling above the fray. The subsequent massive jam explosion just creams the jeans! Tight and sublimely crazy! Eero even dares to pull off a cheeky Jim Morrison imitation that will make anyone smile. Hilarious! Fill in that damn sax blare and people will glare. Tubular bells arrive just in time to save the gong, literally! "Piece of Mind" is led again by that thrilling bass in that classic Howlett/Rowe style, a loopy construction that keeps the imagery flowing. Short sweet and effective. Like I stated earlier, not the best jazz-rock album, nor is it Tasavallan Presidentti's best but there is something about the pervasive comfort of nostalgia that needs not to be explained and just is. Yes, it sounds dated and perhaps not very relevant but I like it. Always have and forever will. Sax is everything!